Arrowe Park, Birkenhead, England, 1929. The Coming of Age Jamboree. 69 countries represented, 50,000 Scouts ( 320,000 visitors). B-P blows the Kudu horn at the opening. 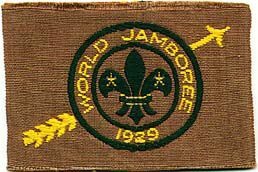 The first Scout Promise. B-P becomes Lord Baden-Powell of Gilwell. Also " the Jamboree of Mud". The Golden Arrow: a hatchet is buried and gilded wooden arrows passed to the nations: " Now I send you forth to your homeland, bearing the sign of peace and good will and fellowship to all your fellowmen. From now on the symbol of peace and goodwill is a golden arrow. Carry that arrow on and on, so that all may know of the brotherhood of men"